It seems taken for granted by many that mainstream media is liberal. From there it’s often assumed that the number of conservative media outlets (ie. Fox News, World Net Daily, Human Events, Right-wing talk radio, etc) are simply the counterbalance. This mostly appears to be true if one simply accepts the “Left-Right line-in-the-sand” that’s been apparently set by a number of (usually “conservative” pundits). However, if one looks at policies from a broader perspective, the “MSM” actually appears to lean rather centrist, and in order to cater to ‘both sides’ actually ends up catering to the right a bit (more on this later). How do we define Liberal? When deciding what we should consider conservative and liberal, it’s important to note that the paradigm has shifted to the right. What now passes as “liberal” in political discourse was once considered centrist if not moderately conservative. It’s important to note this when considering whether a policy being discussed is really liberal. So to put this in context; Richard Nixon expanded government (and proposed more expansion, which was actually prevented by Congress) (read more), was a proponent of renewable energy (read more), and proposed universal health care (read more). While modern fiscal conservatives are pushing for privatizing social security, Harry S Truman once wrote such people off as being a fringe minority and stupid (read more). Grover Norquist, an important figure in the modern conservative movement has openly stated his ideal society reflects early America, as he describes as the “first 120 years, up until Teddy Roosevelt, when the socialists took over.” (read more). The Personal Responsibility and Work Opportunity Act, which scaled back welfare assistance, was passed under the Clinton administration (read more). The tax structure has become less progressive over the years. 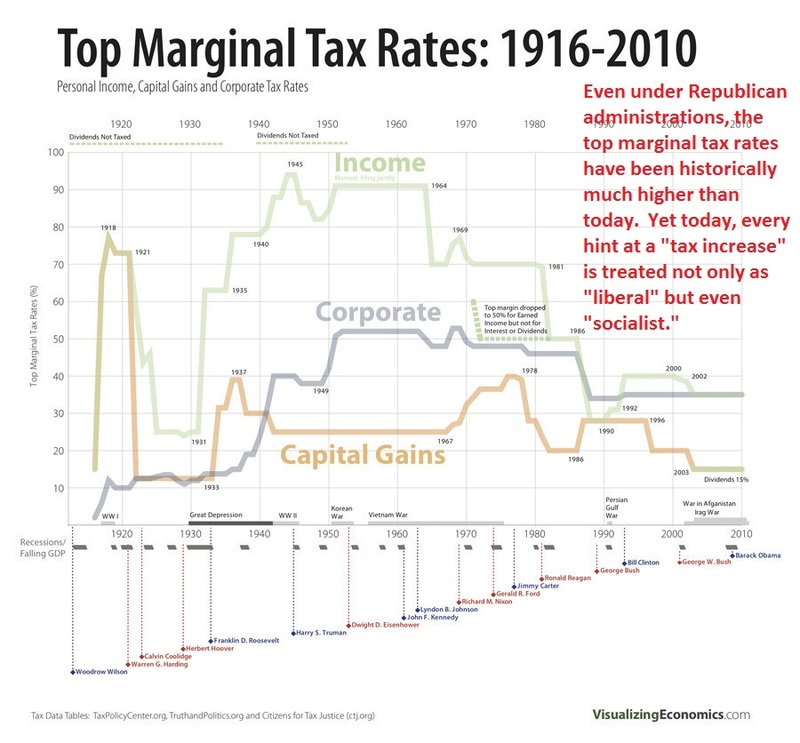 What used to be a top marginal tax rate of 94% is now 35% (see trend here). And for all the talk about runaway government and tax burden, both are much smaller in the US than in most other industrialized nations (compare here). This is rarely if ever revealed in the sound bytes and rhetorical battles that make up most of the political news coverage we see on network television. The user is left with no context from which to really draw a parallel. The user is often left with the impression that taxes on the wealthy continually increase (and that the US is on this socialist spiral). Even the news outlets that are generally labeled as “liberal” rarely disclose this fact. This may be why there exists a disparity between the way people identify themselves and the policies they support. According to the Gallup poll, far more people consider themselves conservative (40%) than liberal (12%) (see Gallup poll). However, when asked about specific policies (like raising taxes on the rich, unionization, health care for all…all of which are considered socialist/populist policies by conservative media/pundits) the disparity disappears, and public opinion is closer to 50/50 (see Gallup poll on taxing the rich and unionization). The reason is likely that many of the hardworking and honest people who don’t see these policies as liberal, think of the word liberal as synonymous with something that looks like a hippie movement from the 60’s. The word liberal has become somewhat taboo, and it’s the reason ‘liberals’ have begun to adopt the word progressive. During the Vietnam War, news outlets were actually covering the carnage, and this led to a backlash against the war. Since then, news outlets have avoided actually airing these scenes. Since the left is generally regarded as anti-war, it’s difficult to argue that mainstream news outlets are acting on behalf of the left. There no doubt exist instances of liberal bias in the media. The question is, do there exist instances of conservative bias in the media, and if so, how do the scales tilt? It’s not difficult to see instances of CNN (which conservatives often dub, the Communist/Clinton News Network) tilting right. For one, it was was CNN who challenged Michael Moore’s Sicko (an expose on the American health care industry and a plea to make it more like our Canadian and European counterparts). And Jon Stewart recently pointed out numerous instances of CNN allowing conservative attacks on Obama’s health care plan to go unchecked. 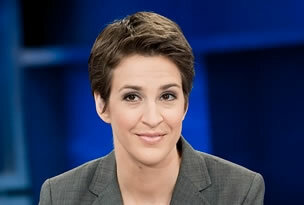 So there clearly exist examples of conservative tilts in the ‘liberal’ media. The question is, how do they balance out? Media Matters is a watchdog group which monitors conservative bias in the media. Media Research Center does the same for liberal media bias. However, Media Matters is far more likely to use non-partisan sources like the Congressional Budget Office to weigh in on budget matters. The MRC continually catered to scare tactics about death panels (the argument that Obama’s health care plan would let seniors ‘expire’ for budgeting purposes) and really clung to the Climategate myth, citing the fact that it was hardly taken seriously by the mainstream media as more proof of liberal bias. There simply seems to be more substance coming from Media Matters. That being said, Media Matters largely ends up focusing on outlets like Fox News, Glenn Beck, and Rush Limbaugh so there is certainly no shortage of subject matter for them. Another common practice from conservatives is accusing a source of being liberal for the mere sake of not agreeing with their conservative sources. The CBO for example, which is charged with projecting the budgetary effects of proposed legislation, is a non-partisan source commonly referred to by both democrats and republicans. However, as can be seen in the recent health care debate, the CBO is summarily dismissed by the right when their report appears to favor ‘liberal’ legislation, like the H.R. 4872, Reconciliation Act of 2010 (Final Health Care Legislation). What is normally considered to be the non-partisan referee suddenly becomes the liberal side of the story. When the media mentions climate change or the gun show loophole, conservative outlets are quick to point to this as an example of liberal bias. These are cases in which conservative outlets simply happen to be on the wrong side of the debate, and the reporting of facts merely appears to be liberally biased. Another way to measure the media’s media’s liberal bias is to compare the reaction to jobs reports. Here are the unemployment numbers for the last few years. 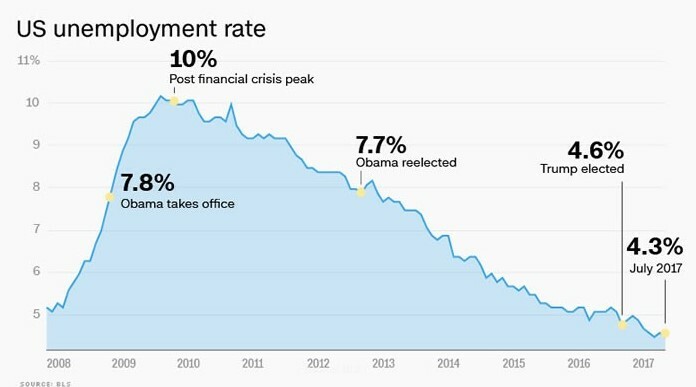 It’s clear that the unemployment has been dropping since 2010. Since around 2013 the economy has steadily added around 100K-200K jobs/month. Now, let’s compare Fox News’ coverage of those jobs reports for President Obama vs President Trump. The very same anchors were describing the net job creation under the Obama administration in dire terms are regarding the same number in gushing terms under Donald Trump. We don’t see a similar duplicitous coverage from CNN or MSNBC. In fact, they routinely have guests on who tout the great jobs and GDP numbers and do so with no push back. 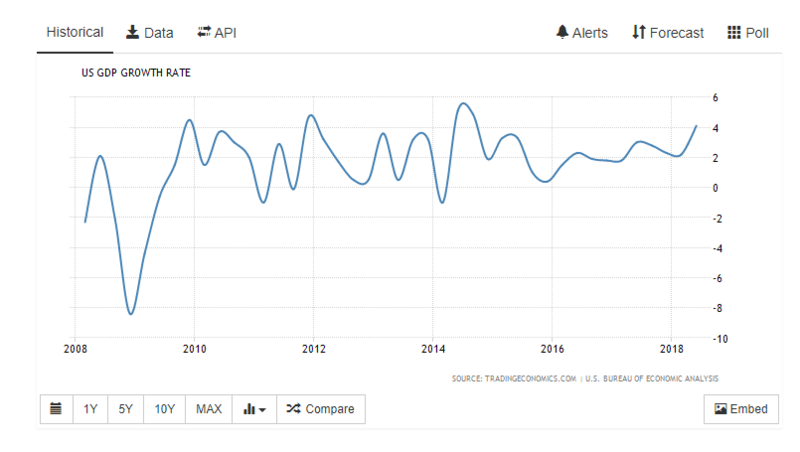 How difficult would it be to simply display charts like these to show that the current trend in job creation is a continuation of the growth that took place under the Obama administration, or that the ‘record high’ GDP numbers are still outpaced by GDP growth under Obama? It would not be very difficult to push back on these talking points by showing that President Trump merely inherited this job growth and that his GDP numbers have yet to match President Obama’s. In an effort to tell both sides to a story, news outlets will include a conservative ‘think tank’ to tell the other side of the story. Note, these are not objective sources looking to merely take the available data and return objective information. A simple reading of their mission statements or about pages make it obvious that they exist for the sake of promoting solutions based on smaller government and personal freedoms. Hence, their position may very well be that of a small fringe of actual economists, but they represent the opinion of such a think tank. The reader/viewer/listener is left with the impression that the two points of view offered represent the spectrum of respectable discourse. Here is Dan Mitchell, from Cato Institute (see their mission statement here) making the argument that raising top marginal tax rates would be punishing the rich and suppressing upward mobility of those below. It’s important to note that the CNN anchor introduces the slight potential tax increase for the wealthy, without ever mentioning the fact that even the proposed increase would leave the top marginal tax rate at a level much lower than it was during the post-world war 2 years. Yet, according to a poll by The Economist (certainly not a liberal paper), in 2008, Economists overwhelmingly favored Obama’s economic plan to John McCain’s (Obama’s tax plan includes a tax hike on the top income earners and McCain’s favors an across-the-board tax cut that organizations like the Cato Institute favor–compare their tax plans here). Again, the CNN viewer is given no context other than hearing two points of view, with the conservative view point consisting of loud and fast talking appeal to emotion arguments. If CNN were really the left wing mouth piece conservatives claim, there are plenty of claims they could have challenged. But the reality of it is, CNN gave 2 opposing view points a platform to argue their points of view. This is generally what it does. Both sides have made the claim that the media played a role in handicapping the election against their side. For example, while many Donald Trump supporters feel his statements were taken out of context, Hillary Clinton supporters believe the media portrayed a false equivalency in regards to their alleged scandals. However, since media bias is generally something argued by those on the right, we’ll focus on those for now. The announcement by James Comey, 10 days before the election has been described as an October surprise “like no other.” The mainstream media outlets reported on this despite the odd circumstances (the DOJ has concerns that it was not standard procedure to make such an announcement while the investigation was still underway). Nevertheless, it was reported and many believe this affected the election outcome. A woman claimed to have been raped by Donald Trump when she was 13. She has dropped the lawsuit twice and hence, it’s difficult to give the accusation any credibility. Yet, if the mainstream media wanted to discredit Donald Trump they could have simply aired the interview (especially before the dropped the lawsuit in early November) and “allowed the viewers to decide” (that they didn’t do this shows integrity in journalism, but it would have been an easy to way to likely destroy Donald Trump’s chances of winning). Despite the fact that numerous Benghazi investigations have cleared Clinton of any charges, the internet and alternative news sources are awash with the claim that the media is avoiding asking Clinton “the tough questions” (questions that were in fact answered long ago). The Liberal Media Bias theory doesn’t appear to hold up to scrutiny. A better explanation is that the playing field has shifted further to the right, making centrist positions simply appear liberal. Furthermore, because the right has been largely hijacked by free market extremists, the position representing the right often comes from well-funded think tanks posing as the other side of the story, which skewing the public’s perception of the political spectrum.